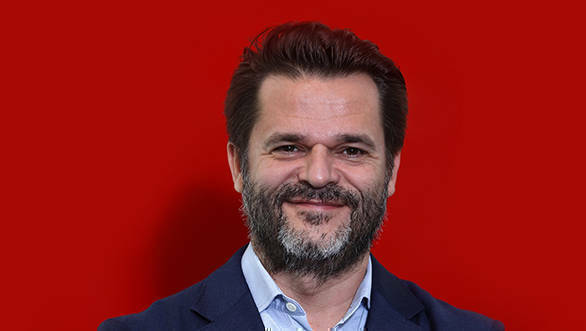 Ducati India sees a change of guard with Sergi Canovas taking over the reins from the erstwhile Managing Director, Ravi Avalur. We caught up with Sergi at the India launch of the all-new Ducati SuperSport and SuperSport S.
OVERDRIVE: Tell us a bit about yourself. Sergio Canovas: I am from Barcelona in Spain, and have been passionate about motorcycles since I was little kid. I got my first motorcycle when I was ten years old, which was a 25cc minibike. My professional experience with motorcycles began with the Piaggio group where I spent twelve years, first taking care of the Spanish market for the brand before moving to Asia where I was taking care of sales and business development in countries like Vietnam, Japan and Indonesia. I started working with Ducati this February, for the Indian market. 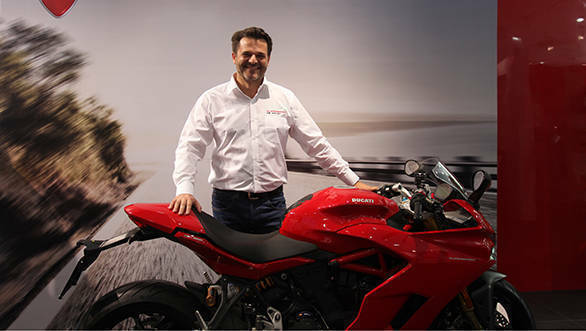 OD: You effectively are Ducati India's second managing director, in the brand's second stint in the market. So where do you think the brand stands right now in a market like India? SC: Ducati is very well-positioned in India, and is identified as a super premium motorcycle brand, one that is associated with high performance motorcycles. On the whole, I think Ducati's positioning in the Indian market is very healthy. OD: You have come in at a time when there is a lot of regulation change happening. How do you think demonitisation and GST have affected business for Ducati in India? SC: It has affected our business but I believe that's only in the short term. I think they are good solutions to help us improve business, especially the GST. We feel these things need to happen to streamline things and there is some disruption at the moment but it is all mainly short term. OD: Ducati falls under the 20 percent tax bracket, particularly in Maharashtra due to your CBU operations. Are you looking to change that by with CKD setup to reduce the burden of taxes and duties on the end customer? SC: We do not have any plans of looking at CKD operations in India, at least not immediately. The Ducati factory in Thailand is an excellent facility for us and the current setup works well given the Free Trade Agreement with Thailand. OD: What do you think of India as a premium motorcycle market on the whole? SC: India is the biggest two-wheeler market in the world now, and that said it has a lot of potential, not only for small capacity motorcycles but also larger capacity machines. Motorcycling is hugely popular in the country and buyers here understand motorcycles well too, which makes it a lucrative one for manufacturers like us. OD: You've sold over 1000 motorcycles in two years. What's the next big step? SC: We are now looking at consolidating ourselves here, which is why we are putting in a lot of effort in to dealer development and launching new models. We expect the market to continue growing despite the small disruptions and also expect ourselves to grow in the coming years. OD: What is your three point agenda for Ducati India? SC: The first agenda is to reinforce our network since that's important to us in terms of getting numbers and meeting customer expectations. That includes not just selling motorcycles but also enhancing customer experiences with the brand through channels like after sales, apparel and accessories. We really are focusing a lot on these things too. Apart from that our agenda includes ensuring Ducati as a brand is a part of our customers' lives. We want to ensure that when someone buys a Ducati he isn't just buying a motorcycle but is entering the Ducati lifestyle and enjoys being a part of it  whether in the saddle of his Ducati or not. The third important point on the agenda is continuing to bring in more and more products that will allow us to enter segments and price brackets that we are not present in currently.